Most folks have never heard of Irlen syndrome. When people ask why my daughter wears tinted spectacles, I tell them it’s because she has Irlen; the usual response is ‘what’s that?’ or ‘isn’t that an American thing?’ Well, actually, ‘yes, it is an American thing’. During the 1980’s, a pioneering psychologist by the name of Helen Irlen, began to study children and adults with learning disabilities and discovered a significant improvement in their reading ability when the page was covered with coloured acetate sheets. This lead to the discovery of a disorder involving the brain’s inability to process visual information – what is now known as Irlen syndrome. There are now 170 clinics worldwide. 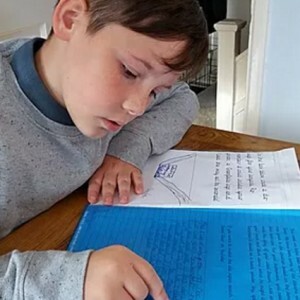 I first encountered Irlen syndrome after my daughter was diagnosed with fairly severe dyslexia – on the report I received, it made mention of Irlen syndrome and suggested a screening. But, at this point, I put it to the back of my mind because my daughter was also about to be assessed for autism. As a young child, Samara was like most other precocious toddlers; she was confident and sociable, loved cuddles and often burst into song in public places. I never thought she would be diagnosed with autism in a million years, but after starting primary school, her issues developed fairly rapidly. At age 6, one of her teachers described her as ‘immature for her age’ – I found this a ridiculous statement as she was 6, of course she was immature! But as time went on, her peers outgrew her educationally and socially. Samara began to find school a constant source of stress, she became violent and every morning became a source of dread in our household. At age 8, she was first assessed for autism, but like many girls on the spectrum, the doctors decided she didn’t meet the criteria because she was sociable; they described her odd behaviour as simply ‘quirky’. And, thus begun the ‘going round in circles’. Without a diagnosis, help for Samara’s issues were virtually non-existent. She frequently missed school because I wasn’t able to get her into the car; she would scream and cry for hours. She hated the classroom, it made her tired. She said the playground was too bright and noisy. She said her friends got annoyed with her because she couldn’t understand their games. Despite, the best efforts of her school, things just got worse. I demanded another autism assessment but in the time being, I looked for any way I could to help her with her sensory issues. I started to research Irlen syndrome; part of me thought it made sense, part of me thought it was pseudo-scientific hogwash, but I decided to get her screened. I went to a local screener, Juanetta Edwards of The Road Ahead; a woman on a mission to raise awareness of this little-know disorder. She confirmed that Samara did have Irlen and provided her with coloured overlays (a coloured, see-through sheet to put over her books to enable her to read easier). I was still a little sceptical, but after a few weeks, it was clear that Samara’s reading had become more fluid and she was able to read for longer periods of time without the usual fidgety-winge combination I had become accustomed to. The next stage was to get her the tinted spectacles. Again, I resisted, partly because of my ongoing scepticism and partly, due to cost as Irlen filters (or tints) are not available on the NHS. However, we went ahead and Samara got her bluey, grey, orange tinted lenses from a Kent based Irlen diagnostician. That was 3 years ago, she now has a diagnosis of ASD and still wears her Irlen spectacles every day and she won’t be without them. To her, the Irlen tints have made a world of difference; lights are no longer dazzling and exhausting, daylight doesn’t give her headaches any more, she can read without the words being ‘slippery’ as she describes it. Educationally, she has made huge progress. For us, her morning meltdowns have decreased significantly and the world isn’t so overwhelming for her. Although I don’t fully understand how the tinted lenses help her, I can’t deny that they do help her and have the effect of dulling over stimulating environments. The Irlen institute predicts that around 15-18% of people have mild to severe Irlen syndrome and its effects can be varied; symptoms include sensitivity to bright light, slow reading, poor comprehension, depth perception issues, headaches and migraines to name but a few. It often co-exists with dyslexia, ADHD and autism. It is now speculated that the prevalence of ASD (and other sensory issues) and ADHD is far more common than we realise. This in mind, I can’t help but wonder how schools, who already struggle to cater for children with additional needs, will cope. I wonder also, if these tinted specs were available on the NHS, how many children’s (or adults) lives would significantly improve because of this simple treatment? Previous Post Nottingham Trent student develops virtual reality technology to help people, like him, who stutter Next Post When is a teacher a salesperson?